We spent some time in the Portland area a while back and one day we took a delightful walk on the Washington side of the Columbia river. The city of Vancouver maintains a wonderful paved path for a couple of miles along the river’s edge and we were out for some exercise. Along the way, we were intrigued by a statue of beautiful woman. We assumed this statue represented Sacagawea, but, as we admired it, the smartphone in my pocket rang a special alert letting me know that the Field Trip App had some information for me. Aha! It was an informational card on this statue. We were wrong, this wasn’t Sacagawea at all. The card that popped up on my screen informed us that this was the Ilchee Moon Girl, daughter of Chinook Chief Concomley and, later, wife of Chief Casinos leader in Vancouver area. According to the card, the Ilchee Moon Girl had the power of a Shaman and she paddled her own canoe, the sign of a chief. Cool! Both Jim and I love history and we would love to stop every time we see a road sign that says, “Historical Marker Ahead,” but we find that is near impossible when you’re traveling in a motorhome towing a car. I have the Historical Marker Database app on our smartphones, but I’ve learned that all of that information is now incorporated in the Field Trip app. Now, whenever I see the sign “Historical Marker Ahead,” I will also hear that special ring on my phone. I pick up my phone and look at the notifications to see the Field Trip icon. With one tap of my finger, I am able to read the complete text of the roadside marker and Jim doesn’t even have to take the rig out of cruise control. If you are traveling solo, you can set the app to read it to you. If your rig has a radio with Bluetooth capability, you can hear it thru your radio’s speakers. Android: You can download Field Trip on an Android device with the Play Store. Just open Play Store and use the Search feature (the magnifying glass icon.) 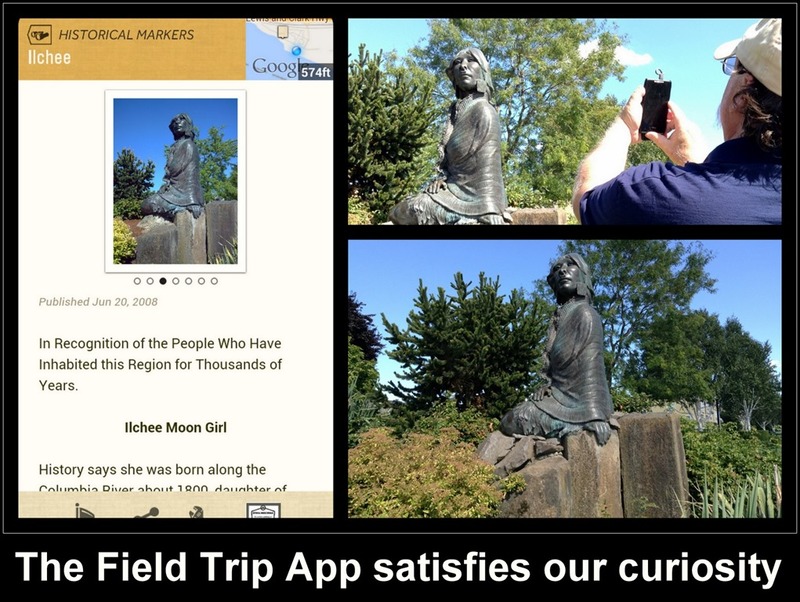 Type in Field Trip and tap Search or Enter. You should see binoculars icon and see the Field Trip title and the developer may be listed as nianticlabs@google, or just Google. It’s free, so all you have to do is tap the install button. iPhone: On an iPhone, open the App Store and use the search (magnifying glass icon) feature. Type in Field Trip and tap Search or Enter. You should see the binoculars icon and a Free button. Tap the free button and it will convert to ‘Install.’ Tap install. You will need to know your AppleID password to continue. iPad: This app is designed for the iPhone. It will run on the iPad, but you won’t see it listed with iPad apps, you need to select the option to show iPhone apps. Then you can search for it and install. If you can’t find it, then use your browser to go to the FieldTripper.com website. There you will see a button for “Available on the App Store,” tap that and you will be directed to the install option. Options: Once you have it installed, take a minute to peruse the different options. You have your choice of viewing Field Trip by a Map, Nearby points of interest, Recent points of interest, or Favorite points of interest. Each point is represented by a card. Tapping on the card icon in the menu bar shows you all the different sources of the various cards and you can choose to see less or more from each source. The explorer’s hat icon lets you select how often you want notifications of nearby cards, and the gear icon lets you select options like when to read the cards to you and how to notify you of nearby cards. You can turn off notifications altogether if you don’t want it to be sounding alerts when you’re not on vacation. However, I left it on and even learned some things about my own hometown! If battery life is an issue for you, you may want to leave this off more often than not. Using the Map view, you can browse a destination other than your current location. Just zoom in on a location until you see the little colored card markers telling you that there is something of interest there. Tap the marker and read the card. It’s a virtual tour guide in your pocket. Published by MrsGeek, in Blog. Tagged with Apps for Travelers, field trip, travel points of interest. Thanks for the info; I just downloaded Field Trip and look forward to using it. I first met you two at one of your classes at Peace River; in 2002/2003?, perhaps your first season as full-timers. I’ve been following you ever since because you give such good advice/tips. Just downloaded Field Trip. Up pop a ton of info about our home town, Los Gatos! Can’t wait to take our walk this morning. It will be wonderful when we travel. Another great tip from “The Geeks”!! Thanks.